It's a cold Sunday afternoon when on the spur of the moment we decide to jump in the car and head off somewhere close and nice for a little stroll. The car took us to Nacton Shores on the the banks of the river Orwell. This place is a little bit of a haven for photographers with twisted, weather worn trees littering the shores after toppling from the eroding bank. The tide was out and the sun was low in the sky making looking at wading birds hard to identify. So me and the wifey took a stroll a little further up the bank amongst the trees to see what we could find. I came across an old fallen branch of what was once, substantial size, but now just crumbling away. I gingerly lifted up the trunk to find a centipede quickly scurrying for cover. I managed to pick it up so I could get a picture of it, rather than take it away to ID it, then have to come back to release it again. It is important that any species you find are released back in the same spot you found them. Otherwise, the new place you release it in may not have the same food for it, might be full of predators waiting for your offering or you could even be introducing a new predator to a little ecosystem which could endanger other insects. Who said ecology was easy??? My wife was on hand and quite happily handled the little wriggler, which was quite surprising as she will run a mile if she sees a spider! 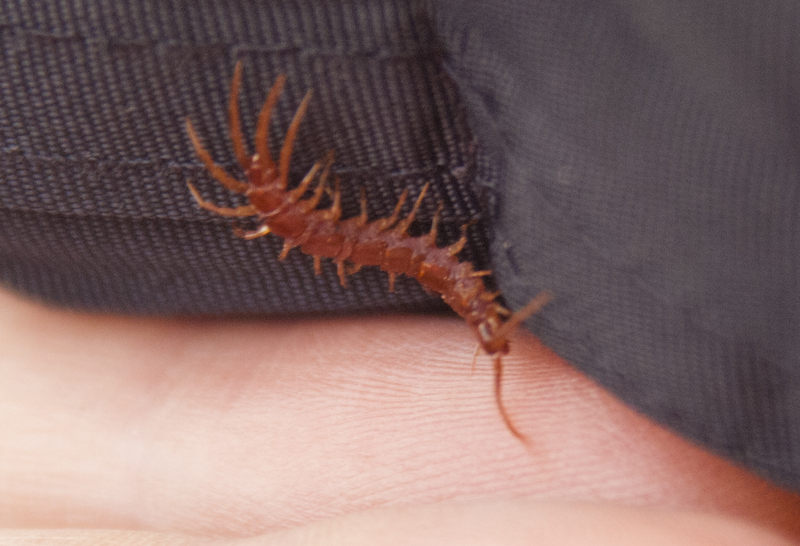 This centipede had 14 pairs of legs, not 4, I don't get it. Anyhoo, the photo I got as it run down my wife's sleeve was about the best one I could get as it was quite a mover. 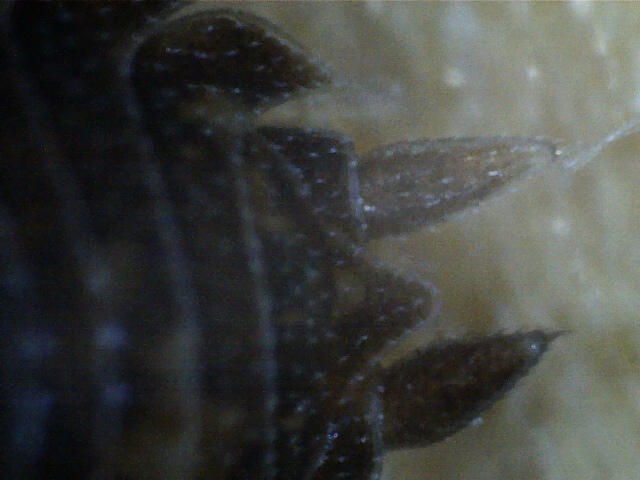 When I got home I found that there were two similar species and thankfully one of the other pictures I took showed the subtle difference I was looking for, a small line down the middle of the head, which my centipede didn't have, making it a Lithobius variegatus. Then I had a look at a few more rotting trunks and branches and found a woodlouse, which again, there are many types of and popping this one into a specimen tube along with a beetle which I had no idea of its ID either. Now the reason I popped these into the tube was because they were dead. So taking them home to ID was going to be much easier, or so I thought. The woodlouse turned out to be Porcellio scaber which I was able to pin down its ID by its tail. The tail of Porcellio scaber magnified. The beetle however still sits on my desk awaiting for identification. This is because I'm still not really sure what this is. I suspect it to be a type flea beetle, but need to do some more research before I can definitely say that. 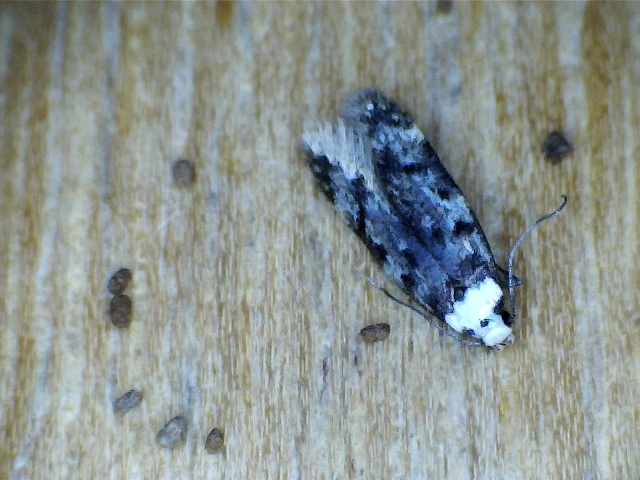 After getting home from our little stroll I get into my office to find a little moth fluttering around. Again, I have no idea what moth this is, but I am going to try and find a good guide to micro and macro moths to help me, or failing that, there's always iSpot! 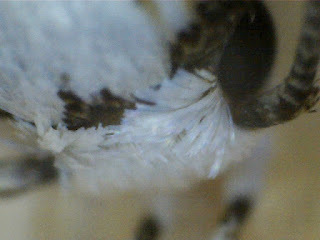 The little moth that was fluttering around my office. of it's 'plumage'. The eye is the dark patch top right. So, although I haven't got ID's for two of the four species I found, they're still going on the list and in time they will be identified. To commemorate passing the 100 species mark, you have been awarded the Rather Nice Bat Award for Biodiversity in Blogging.